The word "grace" is key to our understanding of Christianity. It is really a concept, of God's gracious, generous choice to become flesh in Jesus the Christ. In Christ we receive God's love, not on the basis of our merit but as gift. Grace tells us that we are forgiven and restored to right relationship with God. Not surprisingly, the Salvation Army gave the name Grace to the hospitals it established across the country in the late 19th and early 20th centuries. 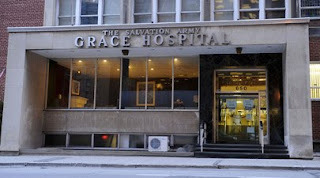 This past week the Army followed through on the commitment it announced last year to withdraw from running Grace hospital in downtown Toronto. The denomination had already begun divesting itself of other hospitals over the past few years, for a number of reasons. However, after a considerable public hue and cry the provincial government and the Salvation Army agreed to continue its partnership at Grace. Various denominations have sponsored hospitals through the years. Virtually every Hotel Dieu hospital in the country originated with the Roman Catholic church. The United Church established hospitals and health missions across the country, although in recent decades our denomination has stepped back from this work. Many dedicated doctors, nurses, and other health professionals served faithfully in these facilities. Shrinking membership in churches and stretched dollars have made this next to impossible to continue, not to mention huge costs for infrastructure upgrades and the purchase of medical technology. What do you think about church involvement in healthcare facilities? I have spoken with agnostic physicians who feel that there is a better ethos in church-related hospitals. Should the Army stay in, or focus efforts elsewhere? To me, ministry takes many forms. Framed in such a way, I'd encourage to Army and other churches with similar arrangements and organizational history to pursue what they sees as the best way forward. On another note: does anyone else find it sad that a nation built on the strength of faith and religion seems now so eager to divest itself of its foundations?